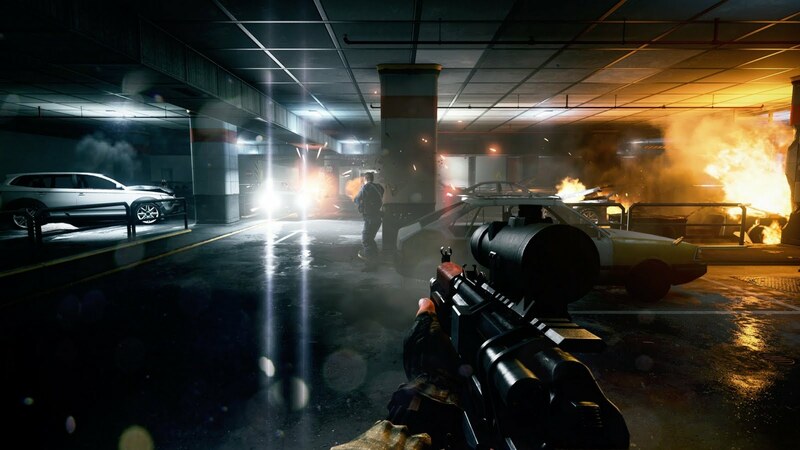 So Battlefield 3 is currently in open beta, which means everyone can play it. Reading this review has finally convinced me to give it a try, but after I was four steps in the registration-process (a nested problem, as it turned out) I quit in disgust. Behold, lensflares in all their glory. As if you’re a camera with a gun. I google “Battlefield 3 Beta”. I do not see a “play here”-button, and all answers are in German. I want an English-page, as I want to sign up/play in that language. I am aware that I can only play it with Origin, so I google that. Ah, there it is! I figure that I can find the game in Origin itsself, and continue from there. Hey, a big “play now”-button. But it is in German. Again. I want to play in English. If I continue from here, the game might be installed in a language I do not want to play in, and chances are I have to either re-install it (lengthy download), or deal with cryptic settings, language packs or hacks. I try switching to the UK-site, which has a completely different layout (which also differs from the Canadian and American websites), but the “play now”-button is now missing. I find it, and click it. It takes me to the facebook-page of BF3. Notice how I wanted to download Origin, but I landed on facebook. Interesting. Also, the site is in German. I want an english site. It tells me I need a key to actually play. Hang on a minute. You said this was an “open beta”. That website I just was on stated “anyone can play”. Why am I required to obtain a key? You’re apparently just throwing them away anyway. Ah, I see. I can get a key by “liking” or “friending” BF3 on facebook. You will get all “news” that are posted by the BF3-page (and probably other Battlefield-games by extension). You can block these, but it is a complex and mind-numbing process, during which facebook will do everything to stop you. All your contacts will know now that you are an “official fan of BF3”. I have no interest in being forced to proclaim universally anything that I do. You have lied to me about the availability of your “free test game”, and are now holding my access hostage, until I submit to your will. People without a facebook-account cannot play the game. Since it already forces you to use the Origin-platform, these people are now being shanghaied into another “service”. This is akin to installers sneaking taskbars onto your computer. You are asking me, a sane person, to add a non-living product as a social contact. Alright. Fine. Whatever. Just let me play it. Surely, after all these hassles, after clicking the damn “like”-button, everything will go smoothly, right? This goes to far. This is where I draw the line. No website/game/social-network has ever required this kind of data. Nobody in my life has ever required this kind of data. This is off-limits. You will not get this. Riiiiight. Remember, this is facebook asking me this, pioneer of data-mining. They never delete anything. Just earlier the day I visited the website of [company], and have been bombarded by [company]-ads ever since. I don’t trust these people. This actual line is a pure insult. After lying to me multiple times, after forcing me to submit to its will, it asks me to “trust” it? So to sum up: I was lied to several times, I was asked for very private and delicate information, I was forced into not one but two separate “services”, everybody knows I want to play the game, my facebook-page will forever receive Battlefield-spam, and a website that deals heavily in information patronized me by telling me to “trust” it with data that is so personal, nobody in my entire life ever asked for it. Thank you, but I think I’ll pass playing this “free game test”. Apparently it carries a cost. Disclaimer: I did this based in Germany. The process might be different in other countries. This was also the most “obvious” way to play. Perhaps there are other, better ways, but after this I’m not going to spend time researching them.